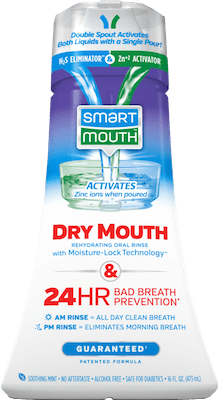 SmartMouth’s Dry Mouth Activated Oral Rinse relieves minor feelings of dry mouth AND contains Smart-Zinc to eliminate* bad breath while keeping it from coming back for a full 12 hours per rinse. Dry mouth symptoms are unpleasant, sticky, and a very common side effect of many medications. Dry mouth also creates the perfect environment for bacteria to produce foul-smelling sulfur gas. Stop dealing with bad breath and the uncomfortable feeling of minor dry mouth symptoms! Never have bad breath AND relieve minor dry mouth symptoms. Available at most CVS, Walgreens, Rite Aid, Walmart, Kmart, Kroger, H-E-B and Albertsons stores. (Some availability at other retailers nationwide). 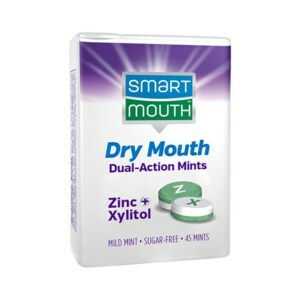 For best results, use with SmartMouth Dry Mouth Activated Oral Rinse. This product is available in select Walmart stores.